Between Sand & Sea. 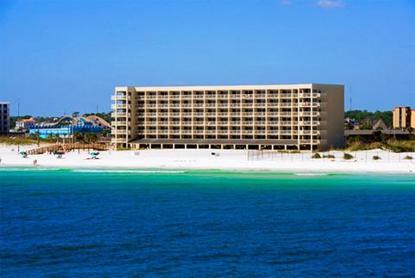 Four Points by Sheraton Destin-Fort Walton Beach is a tropical retreat on the beautiful beaches of the Emerald Coast. Friendly service and a relaxed setting in the Florida panhandle will ensure a great stay, whether you here for work or play.Lots of Extras. Complete with a fresh, new look, all of our guest rooms have free High Speed Internet Access, refrigerators, microwaves, beach towels, and the Four Points by Sheraton Four Comfort Bed. Plus, enjoy our fitness center, outdoor pools, and hot tubs.It Fun to Explore. Great restaurants, nightlife, shopping, the boardwalk, and fishing pier are a short stroll away. The Destin charter boats, golf courses, Big Kahunas Water Park, pontoon boat and Jet Ski rentals, and Silver Sands Factory Outlet Stores are also nearby.Special ConditionsGuest(s) must be at least 21 years of age to register at the hotel. Please contact the hoter for further information.